Welcome to Y.O.G.A for Youth’s North Carolina satellite! Join us for the Y.O.G.A. 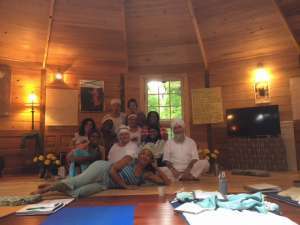 for Youth 40-hour Teacher Training course in Durham, North Carolina starting August 2nd 2019! Photos from our recent, amazing Durham Teacher Training August 1 – 5, 2018! Trainees in attendance represented North Carolina, New York, Pennsylvania, Arkansas and California. Trainees made an onsite visit to the Emily K Center in Durham to observe Y.O.G.A. for Youth Lead Teacher Victoria Smith teaching at the Justice Theater Project summer camp. During the Training, they also had the opportunity to hear from current Y.O.G.A. for Youth Lead Teachers and Teacher Assistants Kenneth Strickland, Victoria Smith, Leticia Garcia Martinez and Christine Abernathy. It’s an exciting time for Y.O.G.A. for Youth N.C. and we’ve got a lot going on in 2018, in terms of partnerships, research and expansion. Read on to catch up and learn more about what we’re up to right now! Y.O.G.A. for Youth North Carolina is supporting a research study by Duke Identity and Diversity Lab, led by Dr. Sarah Gaither about social perceptions in children. Duke University in Durham is currently looking for participants between the ages of 3 and 5 years old for a short study where children play a 5-10 minute game on an iPad and receive sticker prizes at the end. Thanks to a Bass Connections grant from Duke University, Keval Kaur Khalsa, Professor of the Practice of Dance & Theater Studies at Duke and Dr. Michele Berger, Associate Professor in the Department of Women’s & Gender Studies at UNC-Chapel Hill – in conjunction with community educational partners, committed faculty and students from Duke and UNC-CH, and passionate Y.O.G.A. for Youth leaders – are celebrating the fifth year of their Mindfulness in Human Development research project. Using a mixed-methods approach, the project is studying the effects of a regular yoga and meditation practice on middle school students’ mindfulness, emotional regulation, self-esteem, stress response, resilience, academic performance, social behavior body image, and physical health. This is our fourth year of working with the Durham Arts Council’s Creative Arts in Public and Private Schools (CAPS) program, a partnership between the Arts Council and Durham Public Schools. The 46-year-old program places professional artists (including yoga teachers) of all sorts in classrooms across Durham, Granville and Orange counties to provide “creative and interactive residencies” that teach a variety of life skills through the arts to over 20,000 students each year. CAPS artists do other work in the community, as well, and provide programming to childhood centers, preschools and various after-school services. We are excited about returning to Sandy Ridge Elementary School and working with first graders this year. For eight years we have collaborated with the Justice Theater Project to offer yoga programming during summer camps for children at the Emily K Center in Durham and Francis of Assisi Church in Raleigh. Daily yoga and mediation sessions help these young performers be on top of their game!